An amazing front cover, which is essential for any live album. I’ll keep a look out for this one, cause I currently have the Tokyo Tapes (thanks to HMO) and enjoy that thoroughly. Great cover although you can almost make out the cut & paste lines! Once you have this, you will have all the essential live Scorpions. Not to dismiss their later material outright, but this is the good stuff. Great album… and Tokyo Tapes too. Vinyl looks awesome! The Love At First Sting reissue has a great live show with it now too. Slowly catching up on the Scorpions deluxes. Some of them are very pricey imports here. I’d really like to get Savage Amusement next. My first Scorpions album, and 30th anniversary of it! I got all of them. Luckily I got most of them second hand and in new condition! So I got great prices… otherwise I’m not sure I’d have bothered. I agree with you on this one. I loved this album. I had it on CD at one time and have been searching for it on vinyl. This makes me want to find it even more. Great review. Nope. I will get the gatefold vinyl though. 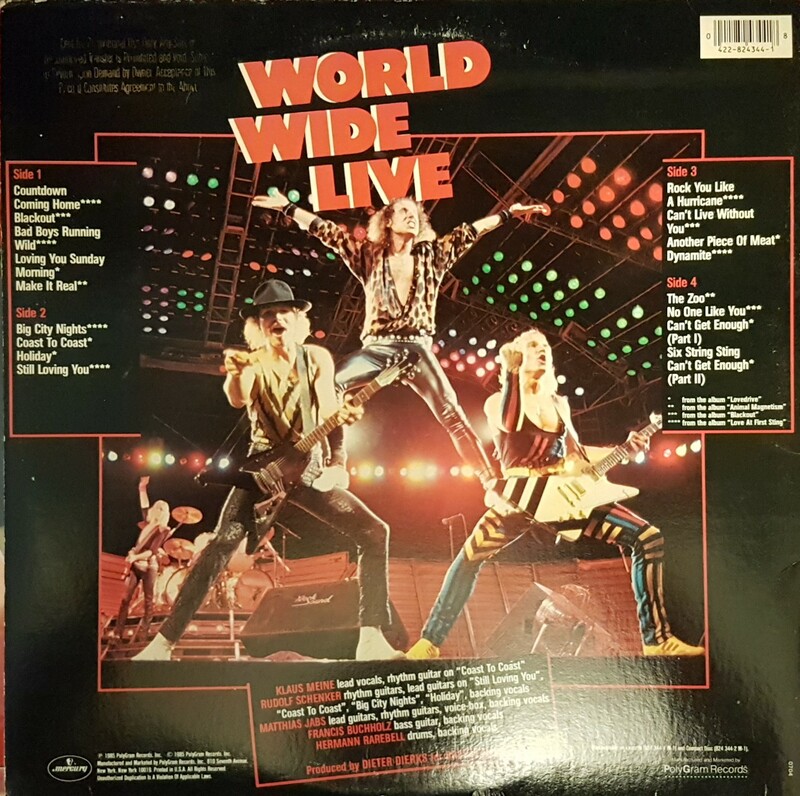 Here’s one for debate: “World Wide Live” has been considered to be one of the three best live albums of all time. I do love this one. I wouldn’t put it in my top 3, but I wouldn’t dismiss it either. Top 3 live albums of the 80s, definitely possible though! I had to click it had no idea what that was but man your spot on with that call! I was pumped when this was released back in 1985….this was a first day purchase…Man I miss those days …. Yes, a good album, and the Scorpions are an underrated band. In case anyone has missed it, they kicked out their longest-serving drummer for substance abuse and now have Micael Kiriakos Delaoglou, a.k.a. Mikkey Dee (whose old boss died not long ago)! 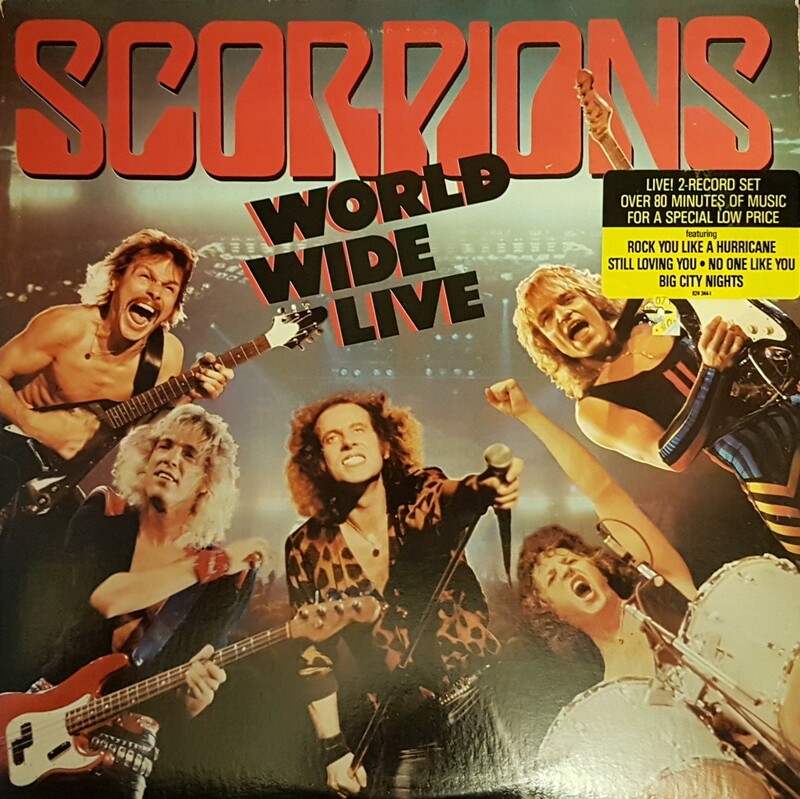 Apart from the Scorpions themselves, I’ve seen Francis Buchholz and Herman Rarebell a couple of times recently as part of Michael Schenker’s band. It was sad when James Kottak had his issues. I hope he is doing better now, Mikkey Dee came as a surprise to me, but he’s been fitting right in! And it was great to get a “name” drummer. Oh the memories. I remember buying this when it came out. I probably had 20 vinyl total this being one of them. And boy did this one get played along side Live after Death and my Kiss vinyl. Those were the days. All wonderful live album to own on vinyl! I’m glad you have it. I wish more bands would make onstage pyramids these days, it’s a bit of a dying art. DId anyone ever do it better than Scorpions? Didn’t the Killer Dwarves have a go?